With Model 883, Bedat & Co keeps its promise to enthral watch lovers with its fine jewellery collection N° 8. Inspired by the aesthetic traditions of Art Deco, this rare and exquisite timepiece epitomises the beautiful marriage of artistic virtuosity and the finest Swiss mastery in watchmaking. With a rosette-styled centre resembling the works of Art Deco Marquetry, this timepiece has been intricately assembled with utmost precision. 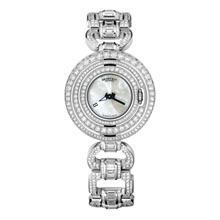 Coupled with white gold rings that encircle the clock face, the design gives the appearance of a shimmering spiral. Twenty-two diamonds of different sizes were carefully selected to highlight the different thickness of the gold rings. These precious stones only serve to bring to light just how meticulously created is this masterpiece. Reflecting the precious jewellery of the nineteen thirties, the white gold bracelet is adorned with 600 diamonds, with the links interconnected by the structured lines of baguette diamonds. 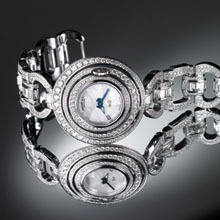 Whilst the timepiece’s elegant clasp incorporates the ‘No. 8’ symbol of the renowned Geneva House, which represents the hourglass but also signifies good fortune. Epitomising the finest in Swiss horological mastery and the world of haute couture, Bedat & Co presents Model 883, an elegant and timeless offering! Reflecting 500 years of genius horological mastery, Bedat & Co’s core values are deeply rooted in the finest art of Swiss watch-making. Thanks to the unswerving collaboration with the best ateliers of the Jura Valley, the brand has the highest standards of master craftsmanship: its Art Deco inspired timepieces are stamped with the A.O.S.C label, the utmost symbol and guarantee of quality and ethics certifying the Swiss origin of all components. When it comes to servicing Bedat & Co’s knowledgeable clientele, refinement and excellence are always the combined benchmark. All Bedat & Co timepieces are covered by an official Five-Year Warranty.